Eggert, Håkan and Razack Lokina. 2007. 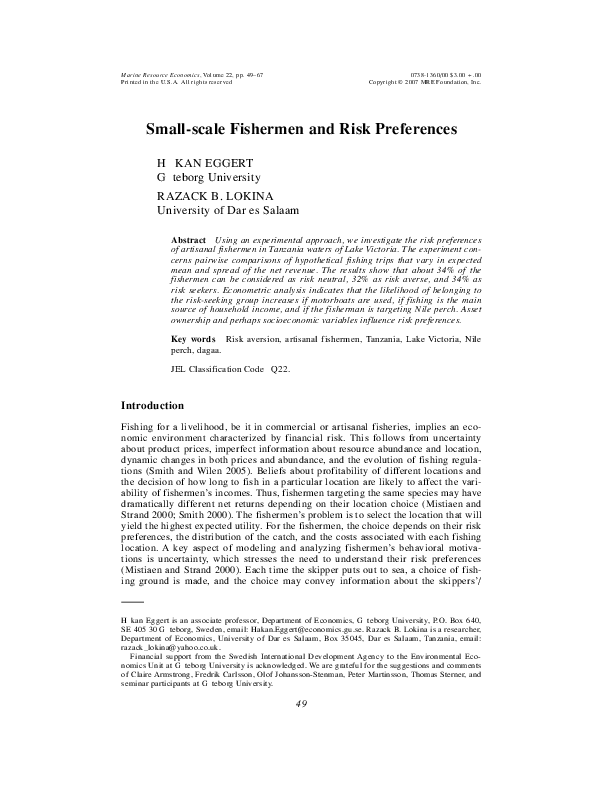 “Small-scale Fishermen and Risk Preferences.” Marine Resource Economics 22:1: 49-67. The results show that about 34% of the fishermen can be considered as risk neutral, 32% as risk averse, and 34% as risk seekers. Econometric analysis indicates that the likelihood of belonging to the risk-seeking group increases if motorboats are used, if fishing is the main source of household income, and if the fisherman is targeting Nile perch. Asset ownership and perhaps socioeconomic variables influence risk preferences.